In Traditional Chinese Medicine, hairy gourd is neutral in nature and is good for people with weak body constitution. It is also mildly cooling and helps to relieve thirst and heat. This Hairy Gourd Soup is one of my quick and easy soup recipes and it can be cooked in about 35 minutes. A member of the gourd family, hairy gourd is also known as fuzzy melon and mo kwa. Just as its name implies, hairy gourd has fine and short hair all over. 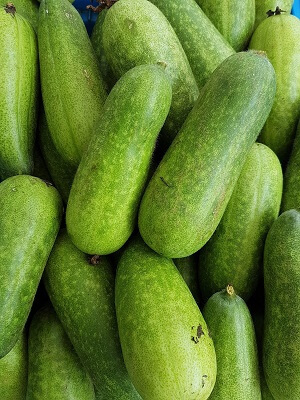 They are shaped like a cucumber and have a delicate and almost bland taste. Commonly used in stir-fries and soups, it can also be filled with a meat stuffing and steamed. The tiny seeds inside will turn soft when cooked so it is not necessary to remove the seeds as they can be eaten. Hairy gourd are commonly available in markets and are inexpensive. When choosing one to buy, try to pick one that is firm to the touch and without blemish. 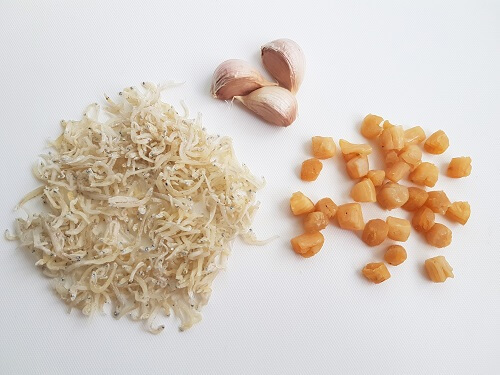 Below are the ingredients I used for the soup base. This will provide the soup with a natural sweetness as the hairy gourd is bland tasting. Dried silverfish and small scallops can be found in Chinese dried goods stalls. Dried silverfish is an ingredient that I sometimes use for quick boil soups. I added some glass noodles as my kids love them. And so do I. They provide an interesting texture to the soup. 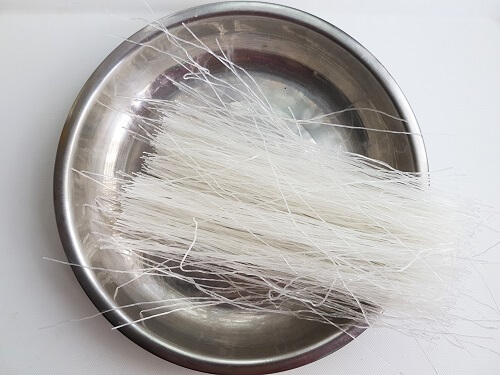 Also known as cellophane noodles, these gluten free noodles are made from mung beans and turn transparent when cooked. Soak the glass noodles in cold water to soften them before cooking. 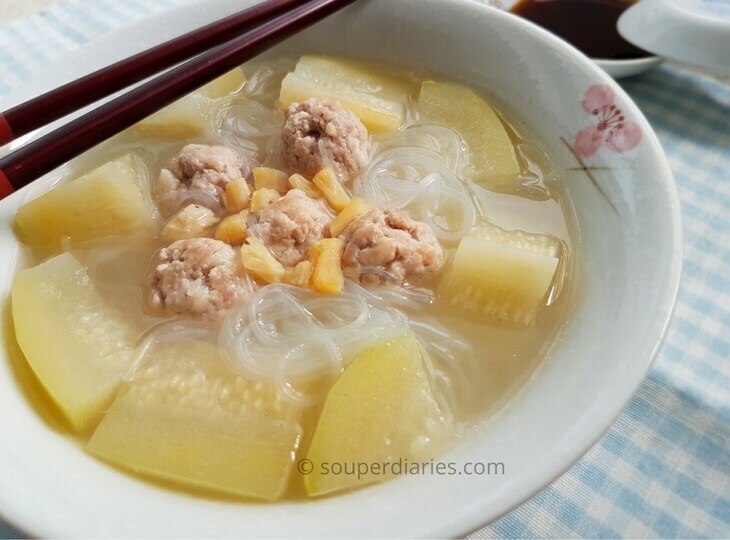 Remember to add the glass noodles to the soup only when you’re ready to eat. Otherwise, if left for too long in the pot, it will soak up the soup and reduce the liquid. This hairy gourd soup can be consumed on its own or with some rice. Last but not least, I hope you’ll enjoy this quick boil hairy gourd soup recipe. 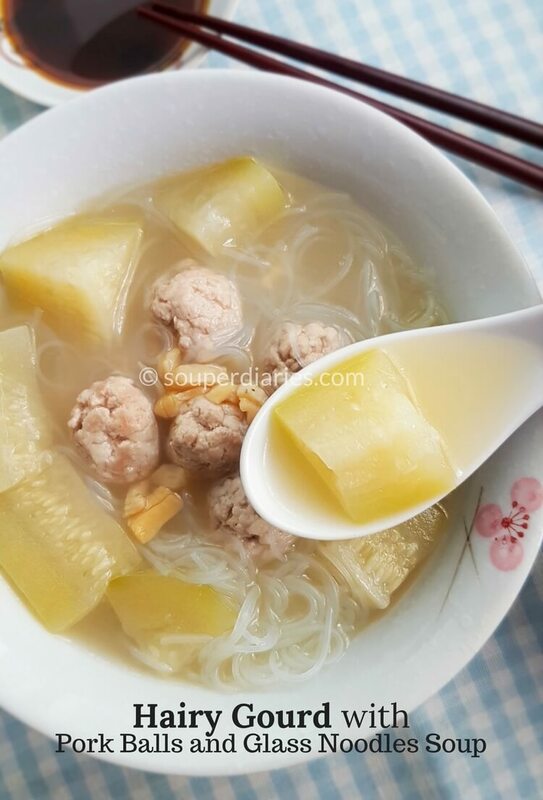 A tasty quick boil soup made with hairy gourd, pork balls and glass noodles. Hairy gourd is neutral in nature and is good for people with weak body constitution. It is also mildly cooling and helps to relieve thirst and heat. Soak the glass noodles. Shape minced pork into small balls. Set aside. Heat up oil in a soup pot. (I used a clay pot) Stir fry minced garlic and dried silverfish for about a minute till fragrant. Pour in water (including soaking water for dried scallops). Add hairy gourd and small dried scallops and bring to a boil. Once it boils, reduce heat and simmer for at least 30 minutes (you may simmer for 15 - 30 minutes more if you prefer the hairy gourd to be softer). Gently tip in pork balls. Let boil for about 5 minutes till they are thoroughly cooked. Add glass noodles and cook for another 1-2 minutes more. Dish up and serve right away. 1. 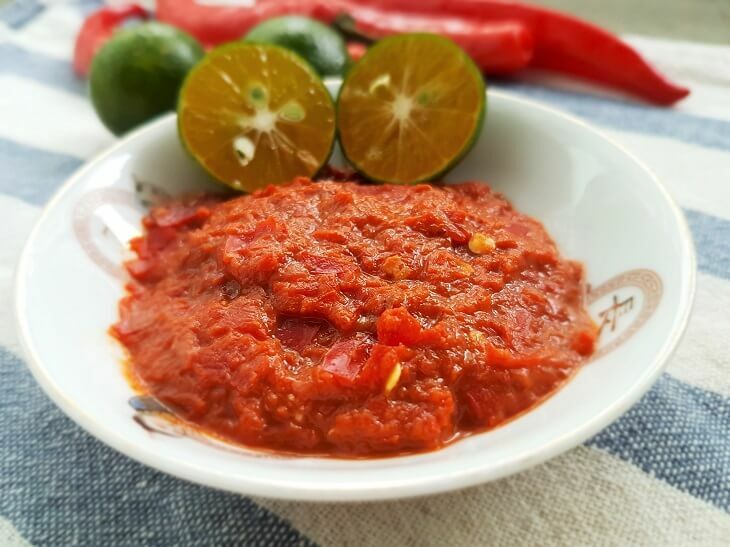 If you don't plan to consume this immediately after cooking, add the mung bean noodles later as they will absorb some of the soup if not eaten right away. 2. Pork balls can be replaced with sliced lean pork if preferred.